WorldsAway was advertised in tech magazines of the time, including Compuserve Magazine, shown here. The first thing you noticed on WorldsAway was the gorgeous artwork. For a graphical world whose primary means of avatar customization consisted of interchangeable heads—there were hundreds of unique options—everything had to look good. Populated by comparatively low-resolution, 256-color dithered sprites (primitive by today’s standards), WorldsAway looked like an animated GIF come to life—albeit one with a unified theme. Artistically, that theme combined a pseudo-classical motif with playful comic-book sensibilities. Columns and ornate fountains dominated the architecture of the Temple Square, and statuary renderings of classical subjects such as The Three Graces and Psyche adorned the green public spaces. WorldsAway plunked Greek statuary into public spaces, as if you were in an ancient Mediterranean city. The mythology behind the game mirrored the artistic theme: As a new player, you arrived on a ship called the Argo. The building at heart of the city took the form of an ancient Greek temple. 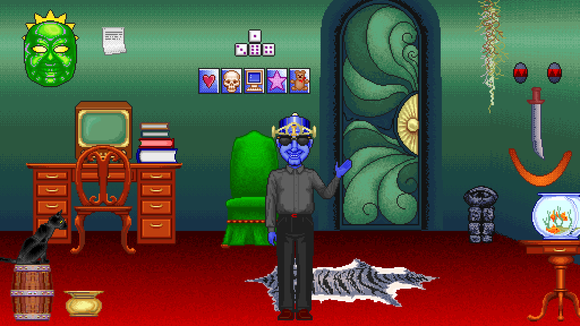 Christian themes seeped in as well: For example, in-game, WorldAway’s administrators (called Oracles, natch) wore long robes like Benedictine monks—complete with creepy peaked hoods that obscured their faces—and went by names such as Brother Echo. Then there was the New-Age hippie vibe: The whole place, put together, was called The Dreamscape, as if it were a shared vision among its participants. The goofy names didn’t end with WorldsAway and Dreamscape: The actual city you visited was named Phantasus, and it was built on the island of Kymer. Because it was all really one place, people tended to use all of these terms interchangeably, and it was quite confusing. The service had wonderful sound effects, too: A Star Trek transporter-like sound when transforming between a ghost and an avatar onscreen, and a computer-like bleep and satisfying thunk from the vending machines (called vendroids). The WorldsAway ATM made a nice antique-cash-register sound when you withdrew money. The entire experience felt satisfyingly cohesive. This typical Dreamscape scenario shows avatars interacting. Avatars waiting to join floated above the scene in a cloud with a mystical eyeball. Within the lushly illustrated Dreamscape, players were presented with a 2D side view of a landscape scene, usually in front of a building. For performance reasons, usually only six avatars could be onscreen at the same time. The rest stayed up in the corner as silent “ghosts,” represented by a cloud with a single, mystical eyeball. Your avatar could talk. The speech appeared over everyone’s avatars in a separate portion of the client window, scrolling past like an IRC chat room, but located over the current speaker’s head. Your avatar could make a few gestures like wave, bow, and jump, and you could change the mood of your character to happy, sad, angry, or neutral. 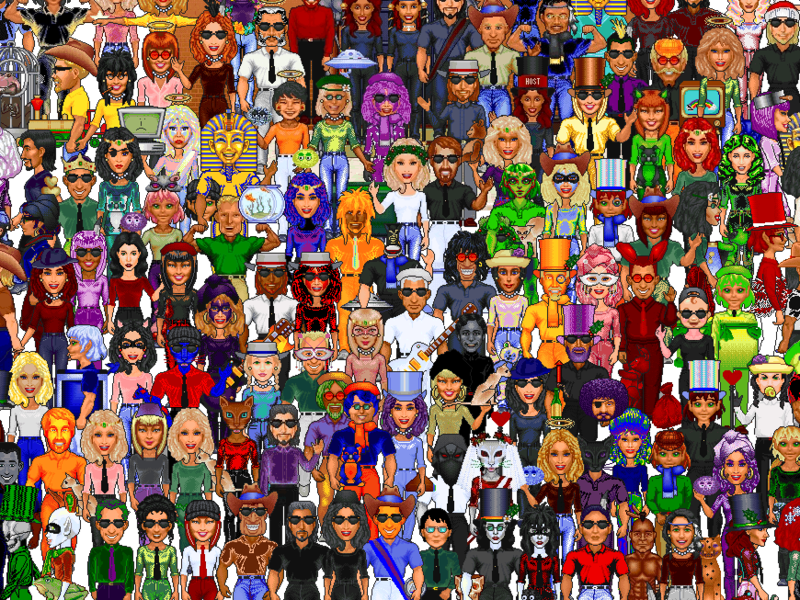 Your WorldsAway avatar always had a specific gender and body type, but you could change the heads easily (there were hundreds of options). Avatar customization was limited in the early days. During character creation, you picked a certain body type—male or female, and thin, fit, or heavy-set (guess which one was the least popular? )—and you were stuck with it. Beyond that, you could change your head to any of the ones available in the vendroids, or you could buy cans of paint to spray your skin or clothes different colors. WorldsAway avatars could purchase "turf" living spaces and collect possessions, using in-game money earned by time spent online. In the game, players could rent their own virtual apartments, called “turfs,” for a monthly fee of in-world tokens. You gained 60 tokens for every hour you were connected. Over time, I saved up for one of the larger turfs, a four-room model, that I decorated to look like a jungle and a comfortable, masculine library. There were also two junk rooms full of all the stuff I’d collected over time. As the point of the service for many people evolved into collecting and trading rare items (then later selling them in player-run turf stores), item management soon became a tricky issue. Certain vendroids sold chests or bags which held about 10 items a piece. Of course, soon your turf would be full of these containers, and you’d have to click on each one for a list of what they contained. My experiences on WorldsAway varied wildly. I wasn’t extremely social, so I tended to sit around by myself a lot, earning tokens. Keep in mind that CompuServe cost something like $4.95 an hour at that time. Because I was connected through my dad’s CompuServe account, I was blithely ignorant of this economic reality. 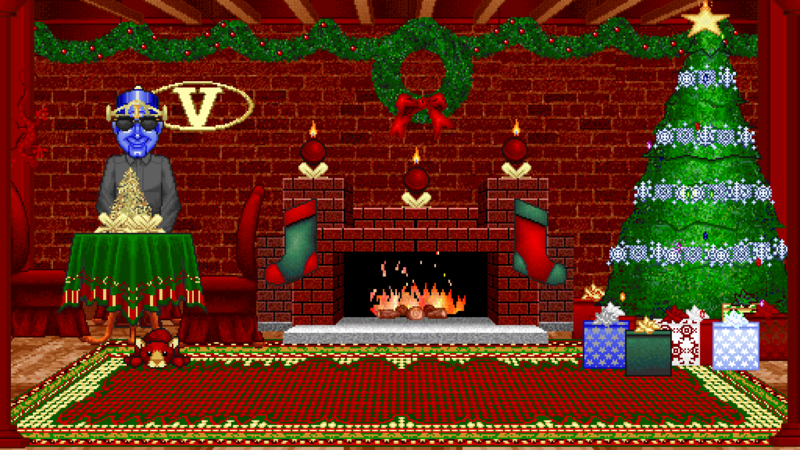 WorldsAway staff always decorated in-world stores for the holidays. In-world events like scavenger hunts or new locale openings brought me back over time, and I did make a handful of long-term friends. Holidays were the best time to be on the service, though, and I checked in every year on Valentine’s Day, Halloween, Thanksgiving, Christmas, and New Years’—especially to get the new holiday-themed items, but also to enjoy the festive decorations. In 1997, WorldsAway moved to the Internet and began charging a monthly subscription fee. Around 1998, Fujitsu sold the rights to WorldsAway to a new company (presumably founded for the purpose of taking over the technology) called VZones. Around that time, Dreamscape’s distinctive art style became corrupted by the introduction of out-of-place Manga-style heads and bizarre, garish item palettes (known as “patch paint” from a bug in the game where they originated). Instead of an animated Roman fresco, the place began to look like a walking MySpace page—a mishmash of ill-conceived appearances designed for maximum individuality, but with a jarring impact. I didn’t connect much in the final years. Not long after I closed my account, I believe ownership of the service changed hands again. The online record is a little fuzzy on this, but WorldsAway appears to have shut down about a year ago. I almost prefer not to know for sure, because I’d rather not taint my warm memories of those pristine early years in the Dreamscape—those years when it truly felt like I visiting another world.